Ernest Fuller has been in the insurance industry for 20 plus years and provides insurance products for some of the nation's leading insurance providers including Blue Cross Blue Shield, Metlife, Safeco, Universal North America, Republic Group and Infinity Insurance. 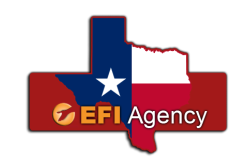 Located in Dallas, Texas and serving Dallas & Fort Worth, EFI Agency offers a variety of different insurance products including auto, life, homeowners, rental, and business insurance. We also offer Specialty Insurance for Truckers, Religious Institution, Non-Profit, Contractor Equipment, Apartment Building, Fitness Centers, Laundromats, Commercial Storage Tanks, and more. EFI Agency serves Dallas, Plano, Fort Worth, Richardson, Garland, Mesquite, Lewisville, Denton, Grand Prairie, Frisco, Allen, McKinney, DeSoto, Duncanville, Lancaster, The Colony, Southlake, Rowlett, Grapevine, Arlington, Irving and other surrounding Dallas Fort Worth cities.